Back then, we strived to bag the best Advance Level results hoping that it’ll make us happy and that things will be better afterwards. So we did, we got the best results and here we are at the Faculty of Management Studies and Commerce, University of Sri Jayewardenepura – the pioneering, largest and leading faculty for management education in the country. That joy of being selected to university was quite short lived however because now looming ahead of us are the challenges of getting through all examinations, polishing up our skills, hunting down a good job, a lucrative career perhaps and if all goes well – a house and a car and a spouse and the list goes on.. Success will come and go and someday hopefully stay, but how about happiness? Is doing this degree making you as happy as you thought it would? Has this journey of going from one life challenge to another been fun? If not, how exactly can you reach for Success and Happiness while gearing yourself you be a Star Employee, a Fantastic Entrepreneur and a Legend of a Human Being? 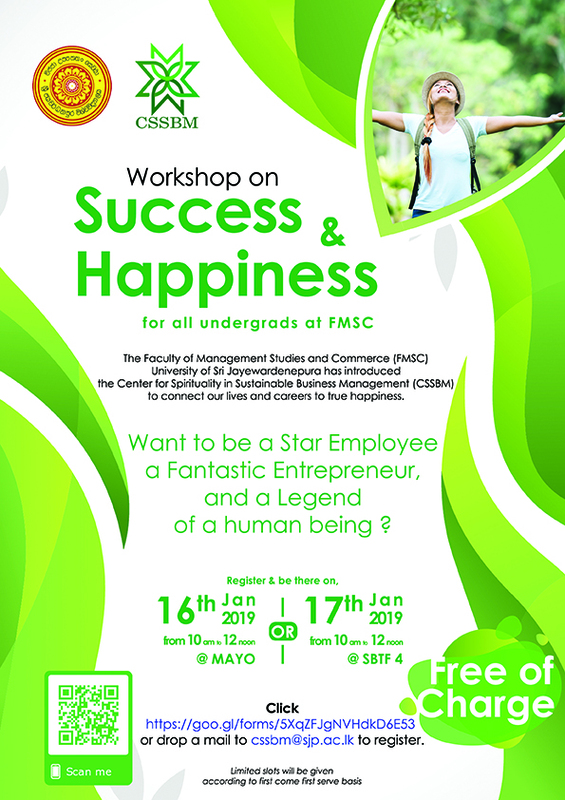 Join us on either 16th January 2019 (at Mayo) OR 17th January 2019 (at SBTF 4) from 10 am to 12 noon and let’s talk about this conveniently forgotten and clearly missing the link between Success and Happiness. It’s an open forum for all undergraduates at FMSC and the limited slots will be provided according to first come first serve basis.